Ever since Thanos made his way into Fortnite as a playable character in one of the Limited time modes as a way not-so-subtle way to promote Avengers: Infinity War we’ve been wondering what franchise Epic will work with next. Today that question has been answered in the from of Wreck-It Ralph, which is, unsurprisingly, another Disney property that’s about to release a new movie - Ralph Breaks the Internet. But Ralph’s integration in Fortnite isn’t quite the same as Thanos’ appearance as, for the time being as least, you can only look at him. 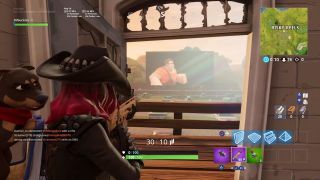 To do so you just need to drop into Risky Reels and focus your attention on the cinema screen. If you’re lucky and don’t get shot in the process, Ralph will make a fleeting appearance on the screen before running off. It doesn’t happen in every match though and the frequency is seemingly random (I had to drop at Risky about ten times before I saw him rush across the screen). So if you miss him just come back again in the next match and try again. So far we don’t know if this is the only appearance Ralph will make or if something bigger is planned for next week's update. The Thanos LTM pretty much dropped out of nowhere so it would make sense that Epic would look to build on that by creating a small in-game tease like this before the main reveal. If we are getting a full on Wreck-It Ralph 2 game mode (please, please, please) then making Ralph a special playable character is almost too perfect a fit for Fortnite given that his ‘job’ is to destroy stuff with his giant fists while shouting “I'm gonna wreck it”. I mean, come on. If that’s not echoing around the map as Ralph smashes down everything in sight after next Tuesday’s update then someone’s missed a trick. Trying to tick off this week's Fortnite Battle Pass Challenges? Here's where to find all the Fortnite Clown Board locations.